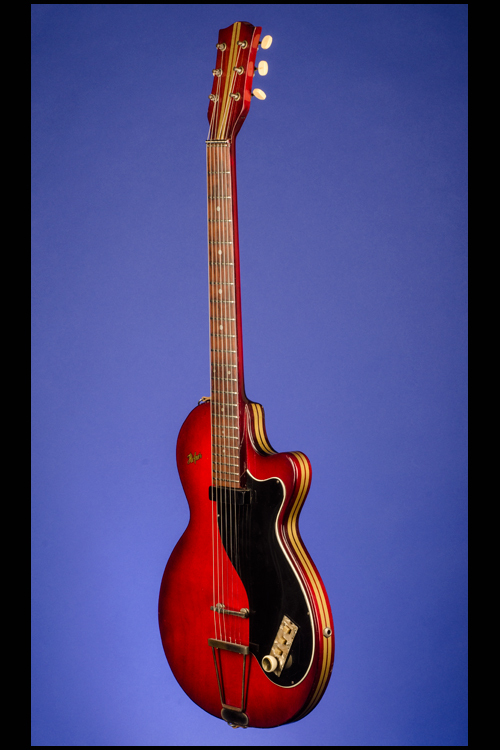 Colorama 443 Guitars | Fretted Americana Inc.
1858 Hofner Colorama 443 (Selmer, London). This 13-inch-wide, 1 /14 inch-deep, electric semi-solid guitar weighs just 4.10 lbs. 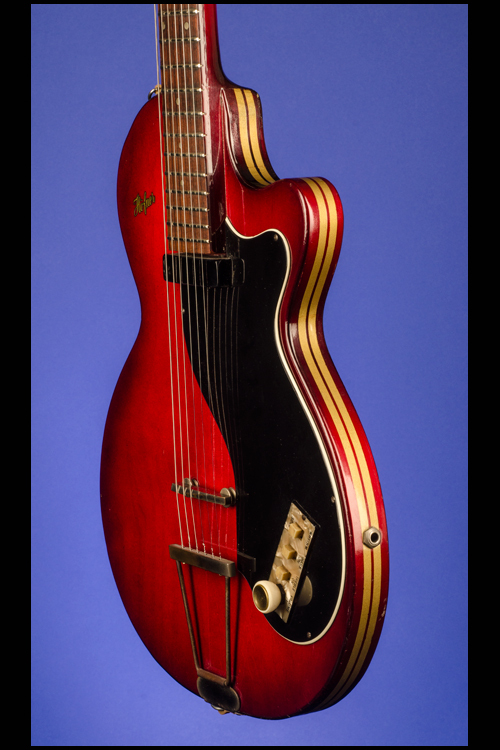 Heavily reinforced laminated plywood top and back over framed sides with a dark red Cellulose finish with twin gold stripes around the edge of the body and on the headstock. On the top of the body (bass side) is the Höfner decal in gold with black trim. Two-piece maple neck with a beech center strip and a nut width of just over 1 11/16 inches, a scale length of 24 1/2 inches and a wonderful thick 'baseball-bat' profile. 'Slab' rosewood fretboard with a three-layer black over white plastic nut, a 'zero' and 22 original medium frets and inlaid pearl dot markers. 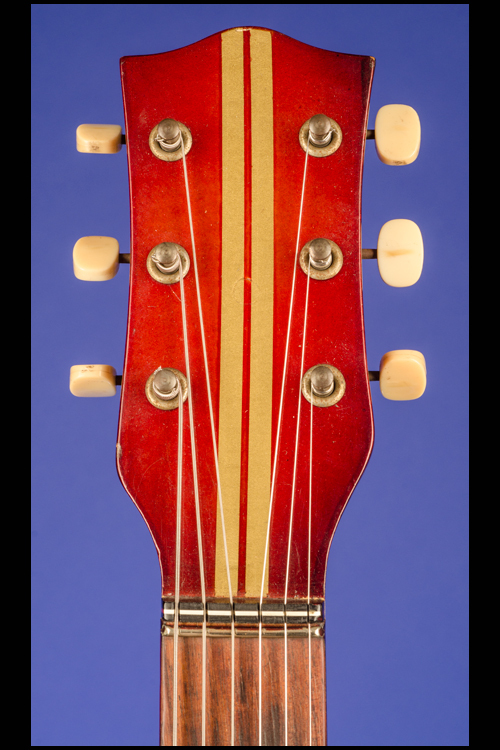 Headstock face with matching twin gold stripes. Three-in-a-line open-back strip tuners with oval white plastic buttons. 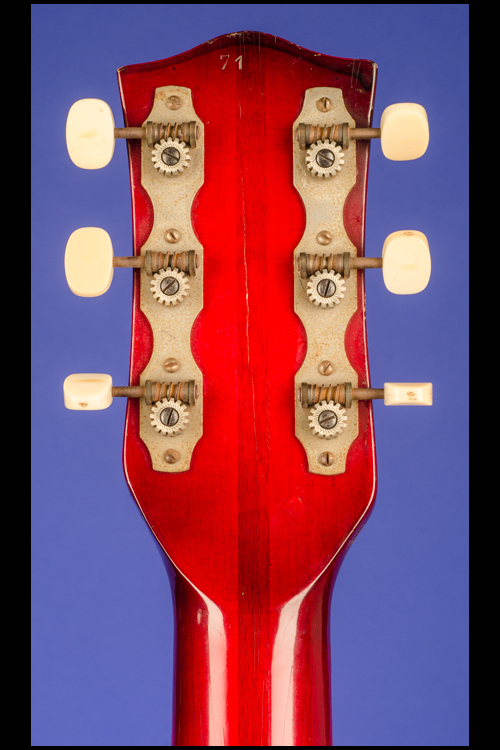 Serial number "71" stamped in blind on the back of the headstock. Specific shaped three-layer, black over white plastic pickguard with four screws. 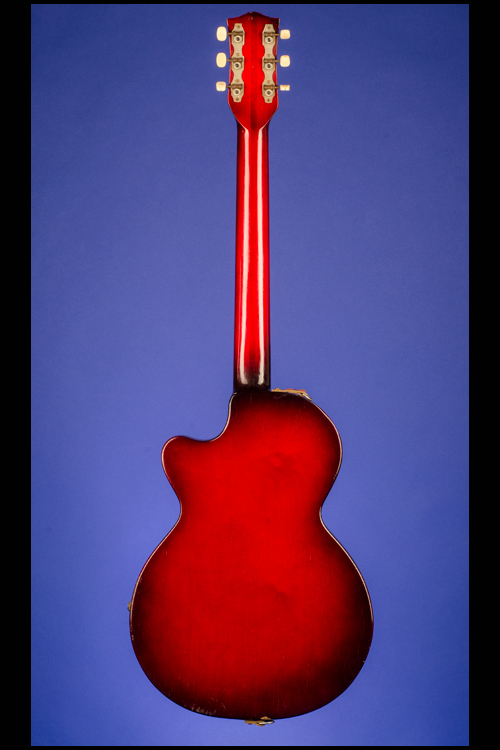 Single Höfner "black-bar" single-coil black plastic 'squared corner' pickup in the neck position with an output of 6.00k. One rotary volume control and three two-way tone-selector slider switches mounted on the pickguard. The 'Preh' potentiometer is stamped "429" (October 1959). Hofner 'teacup' control knob with securing grub screw. Höfner metal bar-bridge on height-adjustable metal base and Höfner basic 'trapeze' tailpiece secured to lower edge by two pins and one screw. A few small surface marks (mainly on the edges) are all that prevent this guitar from being mint. 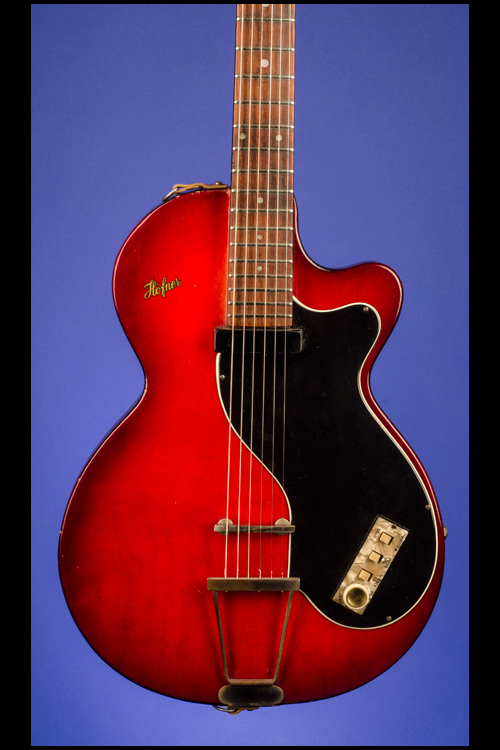 Conservatively, this exceptionally rare little guitar is in near mint (9.25) condition and is complete with the two original brown leather strap fasteners. Housed in the original (to the guitar) three-latch, shaped brown and cream softshell case with brown felt lining (9.00). 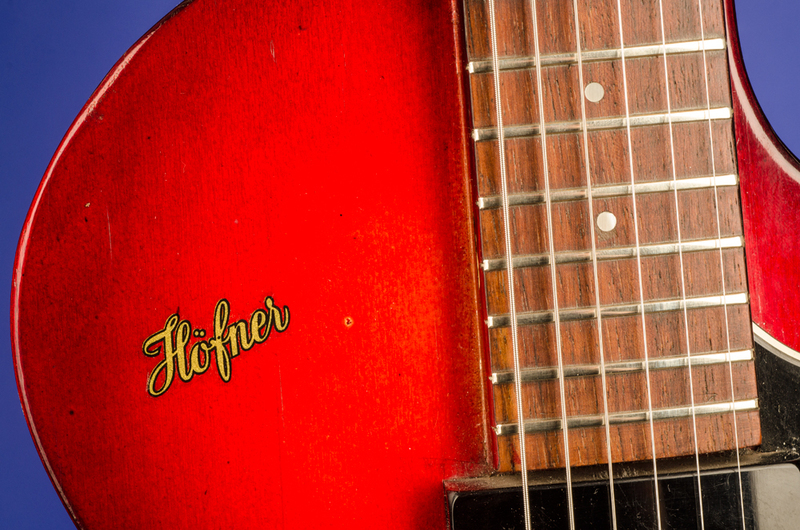 Unlike most of the early Höfner guitars this one has low action and great playability - and also a unique 'rock 'n roll' sound. This model was the first Colorama imported into the UK by Selmer. 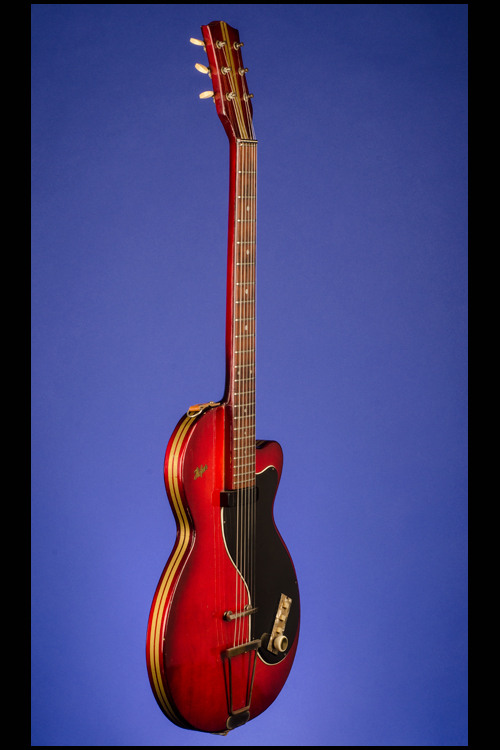 It originally started life in Germany as the Hofner Model 160 (single pickup) and Model 162 (twin pickup) which were produced for the European market from 1956 to 1960. 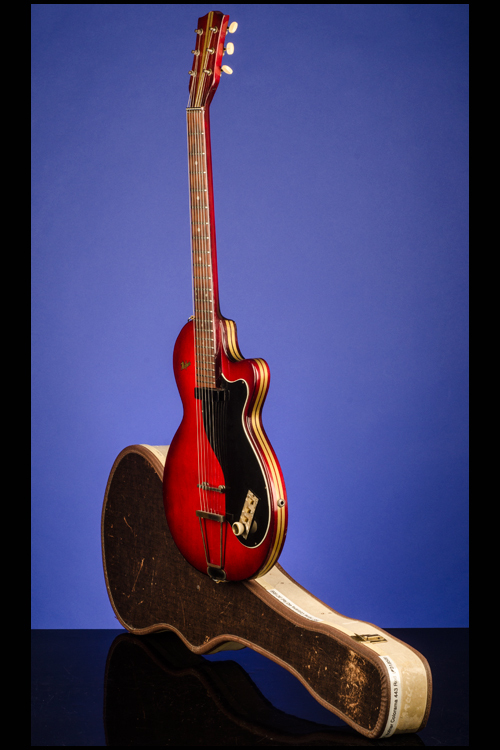 The guitar features a "semi-solid" body, i.e it looks like a solid guitar but is really a heavily reinforced plywood box. 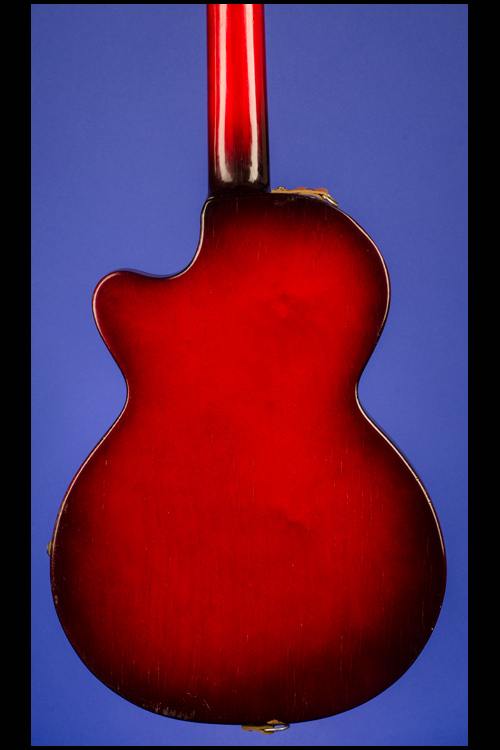 The very earliest examples had a "tear" shaped pickguard, with the later models (1959-60) having a more stylized shape (like this one). 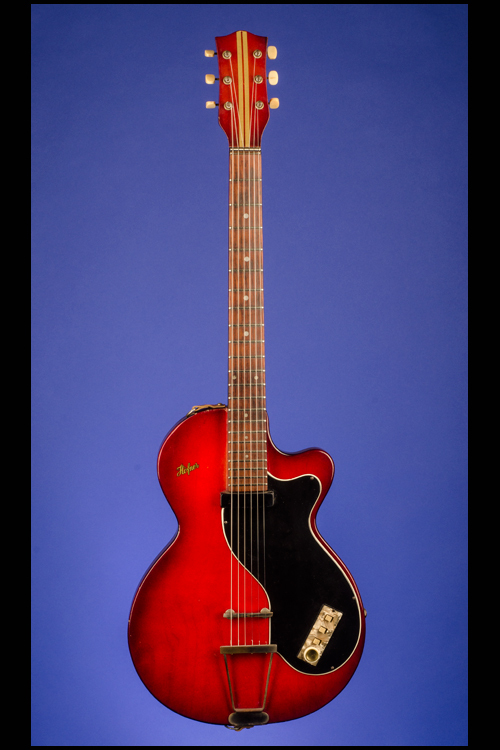 A square cornered version of the standard Hofner "black-bar" pickup was fitted, without the usual rotary height adjustment wheels. The controls were installed in the classic Hofner consul. Metallic finishes were the norm with the first models. 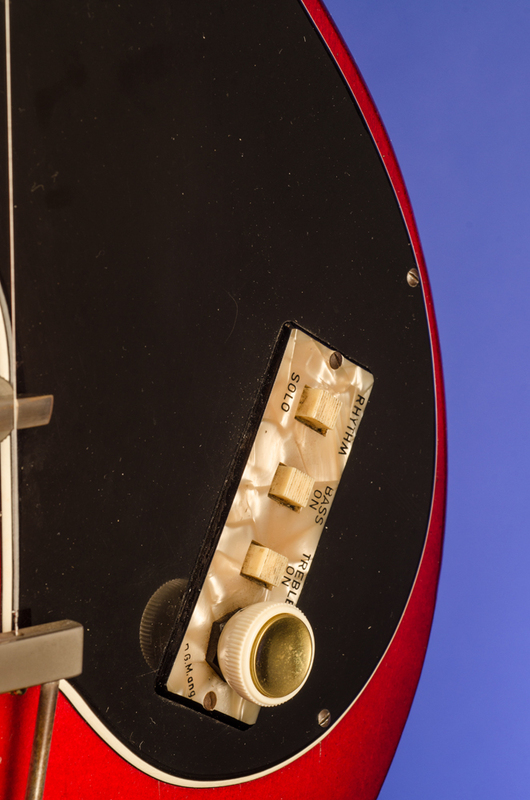 The guitar featured here has an original dark red cellulose finish with twin gold stripes around the edge of the body and on the headstock (a full ten years before Fender used 'racing-stripes' on their Mustang). The Selmer list price in 1959 was eighteen guineas. (The Vintage Hofner Website).